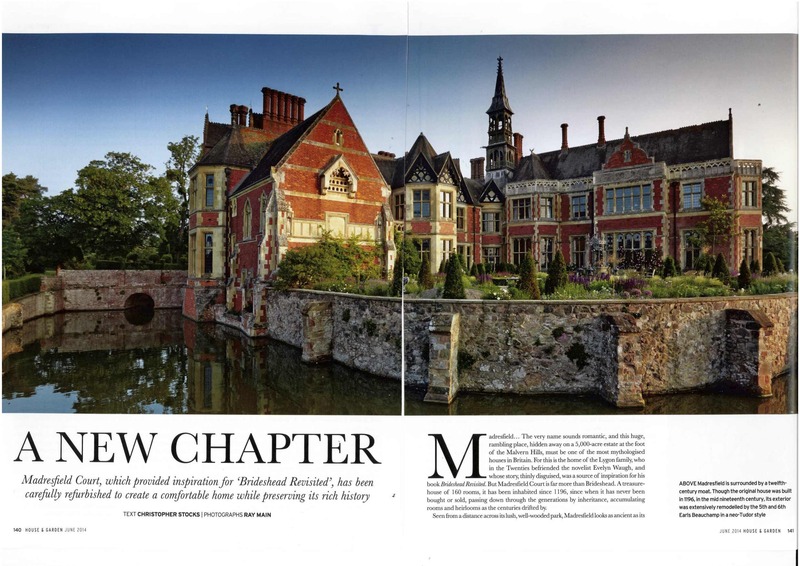 Madresfield… The very name sounds romantic, and this huge, rambling place, hidden away on a 5,000-acre estate at the foot of the Malvern Hills, must be one of the most mythologised houses in Britain. For this is the home of the Lygon family, who in the 1920s befriended the novelist Evelyn Waugh, and whose story, thinly disguised, was the inspiration for Brideshead Revisited. But Madresfield is far more than Brideshead. A treasure-house of 160 rooms, it has been inhabited since 1196, since when it has never been bought or sold, passing down through the generations by inheritance, accumulating rooms and heirlooms as the centuries drifted by. In the distance across its lush, well-wooded park, Madresfield looks as ancient as its history suggests – a picturesque cluster of gables and chimneys surrounded by a moat, silhouetted against the dark, dramatic backdrop of the Malverns. Yet appearances can be deceptive, and as you approach along one of its four long tree-lined avenues, it gradually becomes apparent that the present house is not as historic as it seems. Unfortunately the Lygons came into a lot of money in the early 19th century, and the fifth and sixth Earls Beauchamp refashioned and rebuilt the old house in a style that has less in common with the mellow beauty of Brideshead than the shiny red brick of St Pancras Station. Cross the moat, however, on the narrow brick bridge, go under the arch of the Tudor gatehouse (one of the few fragments of the original house to survive), open the Victorian front door at the end of a deep flagstone passage, and you enter a different world. Though few of Madresfield’s interiors are architecturally distinguished in themselves, it’s a remarkably atmospheric place. I think this is thanks to a combination of things. The literary associations certainly help, but what’s more immediately striking is the range and sheer profligacy of the contents. Everywhere you look there are miniatures, marble busts, paintings, books, inscriptions, glassware, carvings, chests, cabinets, tapestries, silver, cases of Limoges porcelain, rugs, William Morris tiles and wallpaper, carved fireplaces, Chinese lamp bases, bowls, inlaid boxes, stained glass, vases, swords and daggers, all of the highest quality. Madresfield has no overall plan, which makes it a bewildering place for a first-time visitor. Wide passages take seemingly random turns and open onto larger rooms through unexpected corners. A long Edwardian drawing room opens onto a lovely green panelled saloon; directly opposite is the cod-Medieval dining hall, complete with a fake-hammerbeam roof and minstrels’ gallery. Climb a dark, narrow stair behind a curtained recess in a corner of the library, open a double door, and you enter the famous Arts & Crafts chapel, just as it appears in Brideshead Revisited, with its brilliantly painted walls and the triptych, ‘carved,’ as Waugh writes, ‘so as to give it the peculiar property of seeming to have been moulded in plasticine.’ Most extravagant of all is the Staircase Hall, a windowless double-height space at the centre of the house, lit only by three glass domes in the roof. Its eponymous staircase has crystal balusters, and the entire room is a riot of paintings, furniture and mementoes, including an inscribed score of Edward Elgar’s Dream of Gerontius (his father tuned the pianos). Impressive though the new kitchen is, it’s only one of around 60 rooms that Todhunter Earle have redone. Much of the refurbishment has been so subtly executed that it’s hard to tell anything has changed – which of course is precisely the effect they were aiming for. Yet hundreds of chairs and sofas have been resprung and recovered, panelling has been repaired and waxed, rooms refreshed and repainted, pictures conserved and rehung. The biggest job of all has been the creation of 18 new bedrooms, mainly in what were, remembers Emily, ‘small, very spare and crumbly servants’ rooms with ivy growing through the windows. Lucy wanted everything to be comfortable and cosy, so we’ve made sure that every bedroom has a fireplace and all the bathrooms have “proper” furniture.